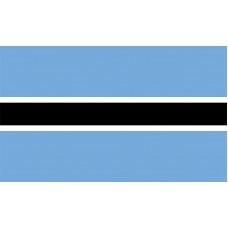 The Botswana Flag is very basic and features a light blue background with a horizontal thin black line with a white frame around it. 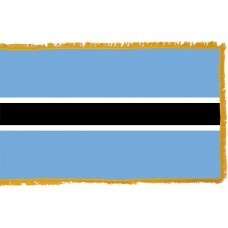 The Botswana flag is used to represent culture, politics and the territory. The light blue color used as the background symbolizes water. The water is presented in the form of rain as rain is very sparse and Botswana frequently suffers with droughts so rain is very valued when it does occur as the country's agriculture relies on it. The blue color was also used in relation to the coat of arms. On the coat of arms, in the light blue ribbon at the bottom, the word "Pula" is written, which translates as "Let there be rain." The black line in the middle with the white border represents the cooperation and amicability between the people of African and European descent. The black and white colors also personify the national animal, which is the zebra. The Botswana flag was first utilized when the country gained independence on September 30th, 1966. It was used to replace the Union Jack flag that was being used. From 1885-1961, Botswana was under the British protection and was known as the "British Protectorate of Bechuanaland." Botswana obtained this title when they needed the British to provide them with protection from the Boers (from the South African Republic), who were invading. The first President, Seretse Khama was a very important figure who helped the country gain independence. Botswana is a landlocked country in the continent of Africa that shares borders with South Africa, Namibia, Zimbabwe and Zambia. The distance between Botswana and Zambia makes it the shortest border in the world. It is also the first democratic state in Africa. Botswana was considered one of the poorest countries in the world and was a very sparsely populated country. However, it has now become one of the fastest growing economies. The economy is dependent on mining, cattle and tourism. Tourists mainly visit Botswana for the safaris and the variation of animals that they can see and wildebeests. Over 40% of the land in Botswana is made up of national parks and wildlife reserves. Two of the most important attractions in Botswana are the "Okavango Delta" and the "Kalahari Desert." The Kalahari Desert covers the majority of Botswana and is home to the Okavango Delta. The Delta is also referred to as the "Jewel of Kalahari" and is considered to be one of the seven wonders of Africa. It is the largest inland delta in the world. At the edge of the desert, in Orapa, one year after gaining independence, a diamond mine was discovered, which is called "Jwaneng Diamond Mine." It is still the richest mine in the world and accounts for a lot of the economy. Botswana is the biggest diamond producing country in the world, providing approximately 18% of the world's diamonds.